The documentary 'Leaving Neverland' has irked supporters of late pop star Michael Jackson, who protested against the airing of the film. The documentary detailing allegations of sexual abuse committed by the late singer is set to air in the U.K. in two parts on Channel 4, starting Wednesday night, according to The Hollywood Reporter. Ahead of the first broadcast of the film, a group of protesters gathered outside the network's London headquarters. According to reports cited by The Hollywood Reporter, a group of about 20 Jackson fans, many holding placards, assembled outside the Channel 4 offices around midday Wednesday, with one of the fan having travelled from as far away as Austria. 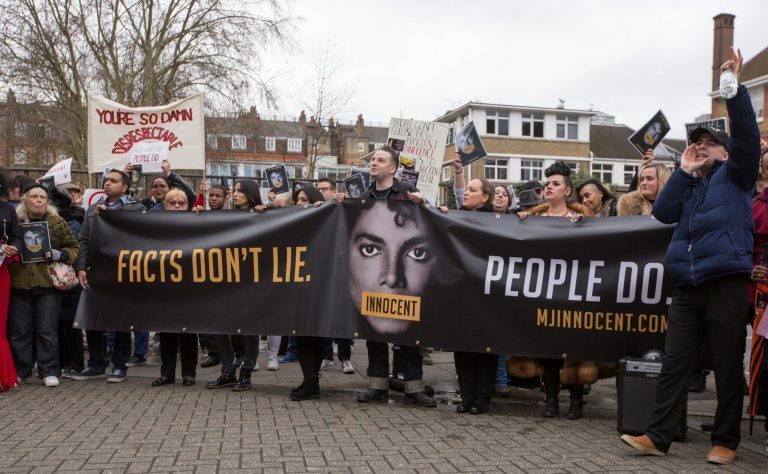 The protesters shouted "innocent," "facts don't lie," and "Channel 4, shame on you," and they criticised the accounts of Wade Robson and James Safechuck. The explosive film tells the story of two men Wade Robson and James Safechuck. Both of the men say that they met Jackson as children when the singer was at the height of his fame in the late 1980s and early 1990s. They allege that Jackson sexually abused them, causing them trauma lasting into their adulthood. However, Jackson's estate has denied all the allegations against the late pop icon and is suing HBO and parent company Time Warner for USD 100 million, claiming that the cable outlet violated a non-disparagement clause in a contract. The lawsuit filed in late February alleges that by co-producing and airing 'Leaving Neverland', the channel is breaching an old contract for showing Jackson in a concert in Bucharest-- the Dangerous Tour, in which it agreed not to disparage the late singer. The suit also stated that the contract covered future disparagement of Jackson and that the documentary allegedly shows the singer molested children on the Dangerous Tour that the concert footage came from. It has asked the court to order arbitration and also stated that the damage could exceed USD 100 million. The documentary 'Leaving Neverland', which debuted in January at the Sundance Film Festival, will air on HBO in two parts on March 3 and 4. Jackson's estate has criticised the film, previously calling it "tabloid character assassination. The documentary detailing allegations of sexual abuse committed by the late singer is set to air in the U.K.
in two parts on Channel 4, starting Wednesday night, according to The Hollywood Reporter.